Laurel Rubber & Gasket is proud to offer the very best in material fabrication. 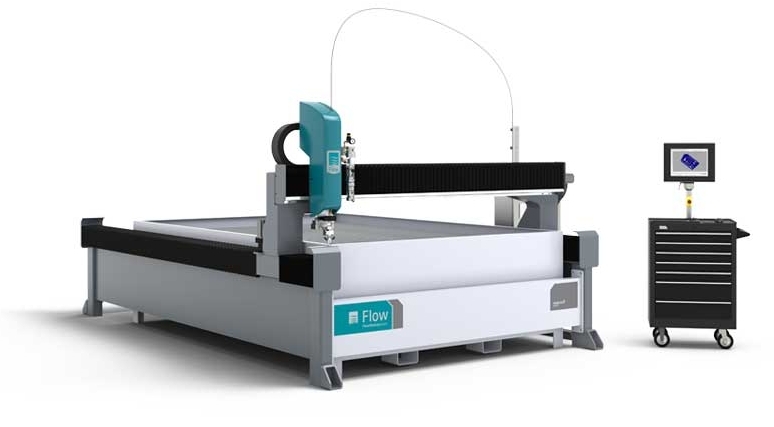 We run two FLOW® Waterjets side by side: one pure water table for rubber, plastics, gaskets, and other soft materials, and one "Mach 2 Waterjet" that can cut virtually any material on Earth. These machines give our customers the advantage when it comes to fluid sealing and custom fabrication. Cutting material with ultra-high pressure water is an involved process that starts with the same water which comes from our faucet. We soften and purify the water before it even reaches the pump. The FLOW® intensifier shifts back and fourth to intake the water which is again filtered by a 1 micron and a .45 micron filter. As the intensifier shifts, it converts 3000 PSI of hydraulic pressure to 60,000 PSI water pressure. That water moves through high pressure tubing to the cutting head. The cutting head contains a valve that shuts the flow off or on to allow the water to be forced thru a jewel orifice to the material. Waterjet cutting isn't actually cutting; it's technically eroding. The result is an extremely effective process acclaimed for speed, accuracy, and cost effectiveness. We invite you to experience the benefits of this remarkable system. UNMATCHED DIVERSITY! WE CAN CUT 1/16" THICK RUBBER AND SWITCH TO 4" THICK STEEL WITH NO CHANGE IN TOOLING. WE CAN IMPORT YOUR DRAWINGS, CREATE NEW CAD FILES FROM SKETCHES OR SAMPLES, OR WORK WITH YOU TO CREATE THE PERFECT PART. REPEATABILITY & FLEXIBILITY: GET THE SAME SHAPE EVERY TIME YOU ORDER, OR MAKE ADJUSTMENTS AS YOU GO. MINIMIZED MATERIAL WASTE TRANSLATES TO LOWER COST! ADJUST EDGE QUALITY AS PER YOUR REQUIREMENTS.